I ride an open cockpit Medium Bacchetta Corsa 650c, laid back and slightly off center with the slight majority of rider weight resting upon the back wheel. The bicycle came standard with a set of Kenda Kaliente. Miffed slightly at the manufacturers stingy choice of tire, I eagerly awaited the day the Kenda wore through so I could replace them. Roughly on about mile 2,600 of rough chip-seal roads, my gravel driveway, and the occasional gravel road in order to get around a stopped train - the tires gave out. Well, not exactly gave out. I likely could have gotten myself home on them if I were out, say 100 miles away from my house, but I noticed a flake of rubber starting to peel off the rear tire tread (I do rotate about every 500 miles, give or take a few). Finally! At last I could order the Gatorskins! With the Gatorskins on the bike, I first noticed the slower, and more sluggish nature of the ride. No regrets though! These puppies are bomb-proof! Note, I never had one single flat on the Kendas. Neither did I have any flats on the Gatorskins either. The Gatorskins lasted for roughly 2,500 miles of the same rough chip-seal roads, my gravel driveway, and the occasional gravel road in order to navigate around the stopped train. Another Gatorskin set was installed promptly at the local bike shop. Another 2,600 uneventful miles later I was back. Notice how many flats I've had. Zero. Zilch. None. Amazing? Perhaps, but that's just how I roll. Regardless, being a sucker for science, I decided to develop more of the trial I had unknowingly embarked upon. Like Pascal, I had to wager. 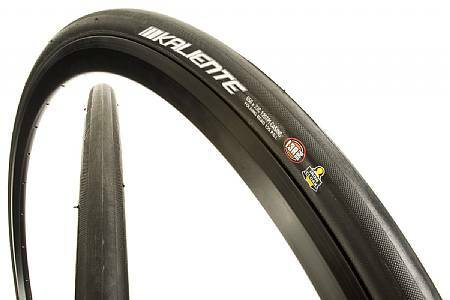 The next tires I bought after the failure of the latest set of Gatorskins was the latest version of the Kenda Kaliente. I immediately noticed the peppy feel of the lighter and more nimble Kendas. Having thought it to be a fluke of conscience, I decided to inquire about the weight difference between the two different tires. On a set, transferring from the Gatorskins to the Kendas, I saved over 200g!!! Compound the rotational force of the heavy tire on top of that, and it is no wonder that I felt an immediate difference! I am now on my second set of Kenda Kalientes since the switch back. I get the same mileage out of each tire, better road feel and grip with the Kendas (especially noticeable in the corners), and a less expensive price tag to boot! I am sold. I agree with Joe Bentrider and have the same bike and tire story. I was dissapointed with the slower feel of the Gatorskins but they hold up. I am now going back to the Kaliente.The logos do wear out due to positioning but no big deal. Great tire for the cost! I have been using this particular tire for the last 9 years and it has served me well. I get 3000 miles out of them. As you may know, buying an expensive tire does not necessarily mean it is superior. All it takes is a shard of glass or some sharp debris in the road to ruin a perfectly good tire. I have used different tires in the past and found these are the best buy for me. I bought this tire as a replacement on my Bacchetta team CA 2. It rides smoothly and easily over highly aggregated asphalt. It appears new even after 1200 hard and fast miles. Seems to be a great tire so far. I have about 200 miles on these so far but they seem to be a great tire, especially for the price. Logo does not hold up on tire, make the tire look old after minimum use. I ride mostly flat terrain, appearance of tire does not hold up and outer belt of tire does not hold up. I ride a hand cycle with tires angled in.